UM music faculty members Robert Riggs (left), Stacy Rodgers and Sue Gaston perform Monday night at Nutt Auditorium as the Oxford Piano Trio. OXFORD, Miss. 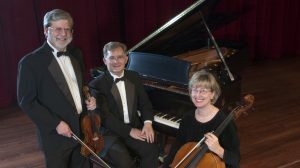 – When they take the stage Monday evening as Oxford Piano Trio, violinist Robert Riggs, pianist Stacy Rodgers and cellist Sue Gaston will have history – as well as music – on their minds. The Oxford Piano Trio performs the work of Schubert, Rachmaninoff and Eric Ewazen at 7:30 p.m. Monday (Feb. 11) in Nutt Auditorium at the University of Mississippi. Friends and collaborators for decades, the trio, all faculty members in the UM Department of Music, will perform work that reminds of them of their earliest days together and contemporary work that points toward the future. “Our program features three very contrasting works,” Riggs said. “The Schubert Trio, as would be expected by a great composer of songs, is a joyous exploration of lyrical melodies. Ewazen’s “Diamond World” is “firmly rooted in the late 20th century, but is not at all what people might expect,” Rodgers said. Coincidentally, all three of these esteemed music faculty members are retiring in June. Tickets to Oxford Piano Trio’s recital are $10, $5 for children and those with an Ole Miss ID, and are available at the UM Box Office and at the door. Proceeds support the music department’s outreach and programming.